I’m not a vegetarian, at least not now, however, since starting a Health Coach Certificate course at the Institute for Integrative Nutrition I’ve been eager to incorporate more vegetables into my every day diet. The notion that food is medicine has strongly resonated with me and I want to feed my body the best so I can feel my best. I’ve been eating less animal products and a lot more vegetarian meals. My diet is always evolving and this way of eating seems to suit my lifestyle right now. With that said my blog has been great motivation for me to come up with delicious vegetarian meals. 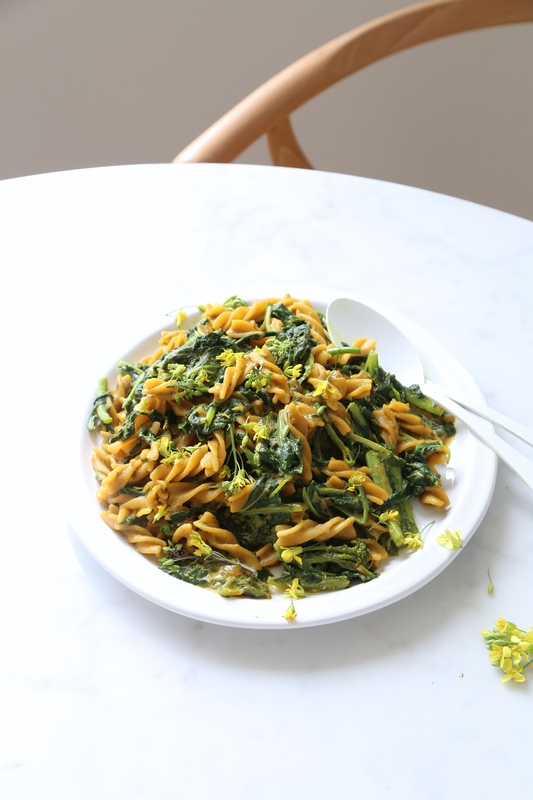 This recipe for Coconut Curry Pasta and Broccoli Rabe will be a go to vegetarian meal for me and maybe for you as well! Eating green vegetables can be tricky for some people. Case in point: my father. The only vegetables he likes are cauliflower and broccoli, and of course they need to be cooked. I personally think that he just doesn’t eat enough vegetables to know that he can like them. This pasta recipe is great for those who want to “sneak” vegetables into their food. I mean who can resist pasta? It’s a comfort food that everyone loves. The best plan is to use alternative gluten-free pastas like quinoa, brown rice, or in this recipe where I’ve used chickpea. Chickpea pasta is packed with protein making it a great choice for a vegetarian meal. I highly recommend Explore Cuisine’s Chickpea Fusilli. Before shooting this recipe I was fortunate enough to find broccoli rabe flowers at the farmers market. Sometimes the broccoli rabe has flowers on it as well. It makes a beautiful garnish for the pasta so make sure to cut some off to sprinkle on the pasta later! Just a quick tip for eating leftover pasta; I recently moved into a new apartment so I don’t have a microwave. I ended up heating up the leftover pasta in a skillet and it was a great call. It tastes delicious when the pasta is toasted! In a skillet over medium-high heat the coconut oil. Add the onion, garlic, and serrano pepper. Cook until onions starts to golden, about 5-7 minutes. Add the ground coriander, turmeric, garam masala, and paprika, cook for an additional 2 minutes. Add the coconut milk, tamari, and coconut sugar. Whisk together. Allow to simmer until thickened, about 20 minutes, whisking occasionally. While the sauce is simmering, bring a large pot of well-salted water to a boil. Cook the pasta according to it's instructions. 5 minutes before the cooking time is up add the broccoli rabe. Cook together for 5 minutes. Strain and place in a large bowl. Once the sauce is thickened whisk in the cilantro. Combine the sauce and the broccoli rabe pasta. Serve immediately! This entry was posted in Main Dishes and tagged gluten-free, nourish, Vegan, Vegetarian, wellness. Bookmark the permalink.